It's on and off with the weather here. Yeah, it's a bit frustrating that we still haven;t a real summertime. It's not bad, the weather, but it isn;t good either. Specially temperature still is much too low, fortunately we have periods with sunshine, and then it feels not too bad. But definately not a time to walk out of the front door in just a pair of trousers and a t-shirt. Wednesday I was a good girl, did some of the necessary housework LOL. Oh yes, dusting, thorough vacuum cleaning even cleaning some windows. Gosh, I felt real good after I finished it. Then I spent about an hour in the garden, some pruning done, took out some overgrowing plants, replanted some, yes, it was nice. In the mean time Jan went to the market, and came back with a full bag. He found green beans, radish, a collieflower, and aubergines. He said, that the auibergines would make a nice change of veggies. Well, he is right about that, but now I have to find a nice recipee for them(he bought 3 of them, ina nice size). so I looed some up yesterday and I think I found a good one, probably will try that out for sunday-dinner. It's done in the oven, with potatoes too, bechamel sauce, tomatoes, and such. 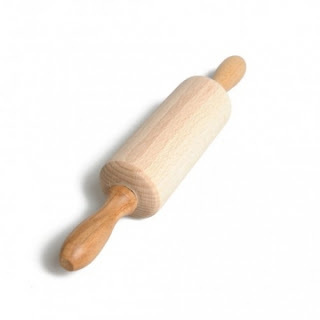 If it turns out well, I could write down the recipee. Yesterday was more the shopping day, had to go to different places to get it all, but have about all for the weekend and longer. Had a good idea for yesterday's dinner( gosh, I am talking a LOT about food today ROFL), I made a potatoe salad, filled with, of course potatoes and then added radishes, some cucumber, apple, black olives, capers, seasoned with a little bit of olive oil and vinager, bit of mustard and some mayonnaise. All topped of with cut slices of smoked salmon. It was real tasty! Then the strawberries with cream as desert. And I was clever, I made enough for today too, tadaaaa!!! We could even have some little pistolets, warm, with it and some seasoned butter with herbs and garlic. If weather brightens up a bit today, we might go again to the market, cause we still need a bit of fruit, have to think of keeping up the vitamine level. 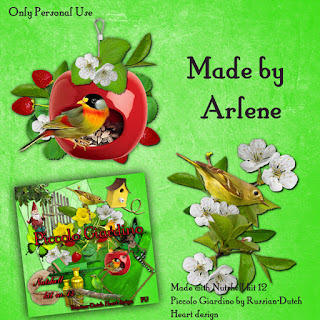 I want to show you a couple of examples of Arlene's creativity. She sent me some beutiful pictures. I had to say from her, that she thanks all designers who offer so freely great stuff, and therefore enabled her to put these pictures together. So the put together picture is completely hers, for some of them she used her own photos. 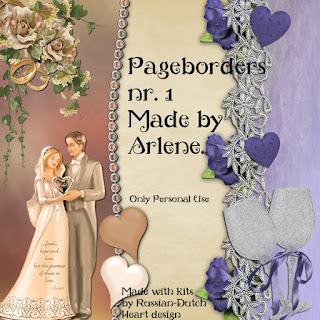 I love the serenity these layouts radiate, don't you? I know I said I might have a few pictures of new blooms in the garden, but I didn;t make them yet. Some need just a couple of days more to show off. So that will be for next week, probably. Now it is about time to have another coffee and make a quick tour in the garden, perhaps work on on a new kit and then get dressed and go to the market or such. 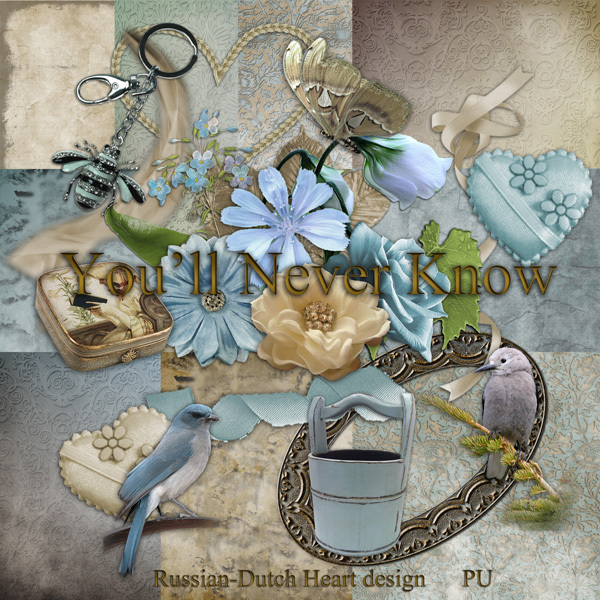 I have a kit that is "soft"looking, but could work wonderful with different kind of layouts, it is named "You'll Never Know". 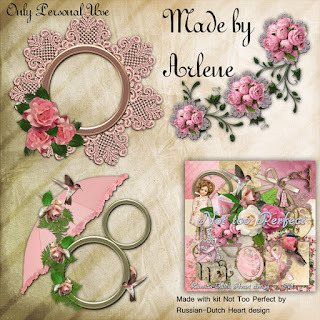 And oh my, you are treated by Arlene again! She has made two clusters and a beauty of a quickpage for you! Now you all take care, have a fantastic weekend! First update on Jan+s case. He went yesterday to the health insurance doctor)another one than he gor the first time'. Oh my, he spent about an hour there, but it was worth it. According to Jan it was a very nice guy, who listend well, understood it also(yeah, that are two different things)!. Well, to make this short, Jan has at the least 3 more months of health insurance, he has to work on his condition, of course as much as possible, ,meaning especially see how the biking goes and if he still has lots of trouble, say pain, after an hour of biking. When he has done that he has to take one or two tablets of the painkillers. No permission to try working for now. After those 3 months he will probably get another invite to come to that doctor. In the mean time doctor will ask Jan+s medical file from his specialist to have more insight. Jan gave him permission to do so, and I think it´s a good thing, this doctor wants to know all of it. Well, we see what happens then. Oh, I was a busy lady on Monday! I just had no inspiration for dinner, then suddenly as in a flash, I got an idea, to have a bit different dinner than just meat, potatoes and veggies. I made little pies, pirogi, filled with minced meat. And to it I made a well filled soup. Okay, the pies weren+t yet shaped as they should, there is some improvemnt to do in that, but the pastry was good, filling too, so if you closed your eyes and didn+t have to look ad the bit odd shape, you could swear they were made by a real good piemaker LOL! Together with a big bowl of chicken soup you had a substantial meal. To that as desert strawberries with whipped cream (the 1st strawberries this year and how I longed to them) . I even had enough of the little pies and the soup for dinner yesterday too, now that was an easy day cooking wise! As we have on and off moments speaking of the weather, we can spend some moments in the garden, and in the sun it is quite pleasant. But temperatures are way too low for this time of the year, we should have them at the least 6 or 7 degrees higher! I took a bit of day off yesterday and went to the town centre,not for something special, just to have a look around, and yippee, I found a pair of trousers for me, I could do with a couple of new ones, and it+s a pair of trouwers of real good quality, but in sale, and I just payed5 euro for it. Now is that a good buy or not? 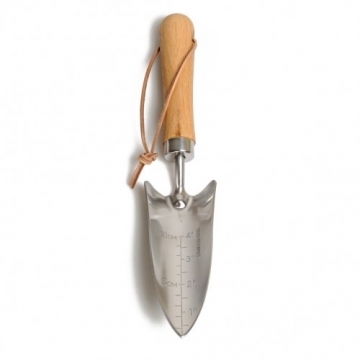 I also bought us a sweet little scoop for replanting seddlings, I have a picture of it, but just imagine it 3 sizes smaller. Also bought me some kitchen string, good for making filled meat or such. I could soend a little money because we also got Jan´s taxmoney on our bankaccount. So we have a little bit of air, money wise spoken. But we keep some of it in reserve, as much as we can, you never know what you might need it for. All together I was a happy person yesterday, when I came home ROFL. I think I can make some new pictures of the garden to show you may be Friday. Plants are really speeding up now and one oafter another starts to bloom. Also can mention that the frog and toad population in it, is happily hopping around, saw a couple of them yesterday evening again. Jan already suggested that it would be time to give them names LOL! Only a bit difficult to tell who we see, it might be Jack as well as Jimmy, grin grin. To really know we should give them a little number with luminous paint on their back !! Enough stupid talk now Time to post the freebie now. I promised you a kit today and so it will be. 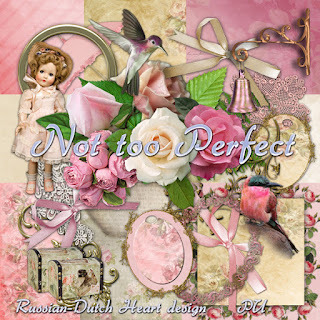 It is named ¨Not Too Perfect^, a bit vintage, I`ve made you a stacked paper in it too. Together with lovely slusters from Arlene, you could play along. Okay, time to finish theis post, I have time to play a bit in PSE, then have to do probably some work in the house. May be in the afternoon I can work a bit in the garden. Have a real nice day, thanks for your visits! Sooooo much wind these days. Okay, we had some real rain showers, the garden was somewhat happy with it LOL. In between the weather, talking temperature, isn;t all too bad, although it's several degrees below normal. But it's such a pity there is sooo much wind. That makes it not fun to be outside. However yesterday there was a period that it was dry and the sun was shining and that was making it rather nice to be outside for a moment. In our garden we didn;t suffer too much from the wind. So I could give my climbing rose a make over to look decent again. Took out the bloomed flowerhead, it helps to let the rose produce some more buds. So for an hour or so, it was nice being in the garden. Later clouds came in and some rain every now and then, better to be inside again. Did a laundry, and also shortened Jan;s last new trouser. Pfffff, I hope that was the last for a longer time now. Well, I think he has enough new ones for the year round. It was amazing how energetic I felt, the more because somehow Saturday night I had trouble sleeping. I woke up two times, the last time with a starting headache, not fun, so I took a paracetamol, sat for a moment on the couch and decided that it wouldn;t help to go back to bed again, so I took some sleep on the couch, Good idea, finally got some hours and when I woke up, headache was gone too. After some blogreading and such, took a hot shower, that felt real good, and didn;t do much else that day. 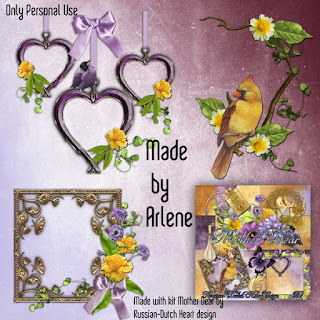 I did a bit of designing at the computer, made some previews of new clusters from Arlene she had sent me, watched a bit of sport at tv and finally made dinner. I collected a little harvest from our own sugar snaps, not enough for both of us, so I mixed it with a red paprika and some onion, stir fried them and oh it tasted so well. The sugar snaps were so sweet, definately have to plant more mext year! Made a chicken filet, filled with salami and some left over from a camembert, and some boiled potatoes to it. And last, but surely nt least I had strawberries for the desert. It were the first we had this year, and with some iced sugar and whipped cream, they tasted delicious! I had quit a full stomach after this all LOL! Just had a nice mail from Heidi too. Her daughter Séverine, takes judo lessons. She seems to do rather good, and Saturday she had another exam to do. And she did very well. At the moment she has the orange belt, but did this exam so well that she skipped the two following slips to it and already has the brown slip. I am so proud of her!. Tomorrow will be a bit of exciting day, then Jan has to go to the doctor of the health security, we'll sdee what this guy decides for Jan. Can he stay for a longer time in the health insurance stuff, or should he go working again, perhaps partly, or do they have another solution for him. I don;t think Jan can go back to the home care, that won;t do. Before worrying about that, we just have to wait the opinion of that doctor. Cross fingers it will be a descent solution. 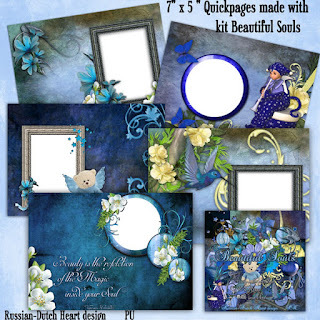 Today I think I won't offer you a kit, but a 5 quickpages I;ve made of a kit Beauiful Souls. ( I think I offered that one in February). 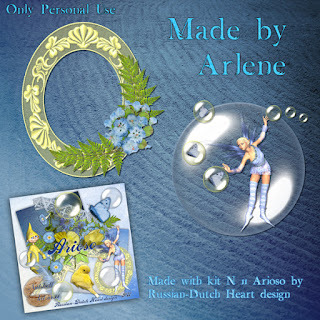 And I have two downloads from Arlene for you. 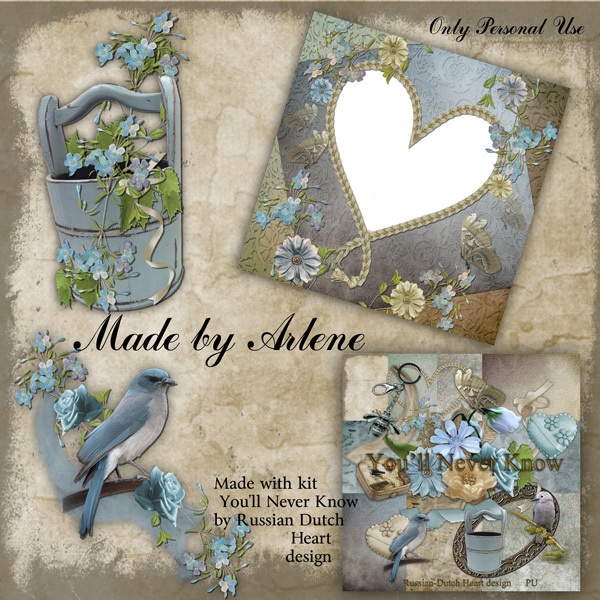 She sometimes sends me some work she made from several of my kits together, and she makes beautiful stuff with it. 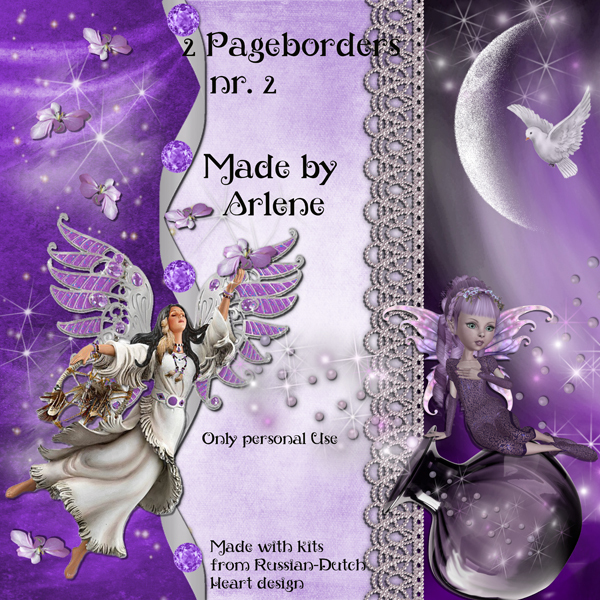 This time two sets of pageborders for you. So I hope you still are a bit happy with these freebies, promise that Wednesday I will have another kit for you. Have a lovely Monday, till later! Gone are the summer-like days! We had a couple of real nice days, but today it seems to be the end of it. At the moment we have heavy rainshowers, which is not too bad for the gardens, but one or two is good, more is not nice. Hopefully they will pass quickly. Pity that temperature will drop drasticaly the next days, and I hate those great differences in temperature. two days we had about 25-28 degress C ( 77 to about 83 F) and next days it will drop to about 17-18 C( around 64 F). No wonder people have a cold all the time! I had some vague plans for things I wanted to do yesterday, like painting the walls in the kitchen, now that they dried up well after the big leak we had some time ago. I even had the paintbucket and roller ready for it, looked for some old clothes to wear, all ready for the work. But it never came to that. Got a phonecall from Heidi yesterday morning that she would come to a quick visit in the early afternoon. As it was a long time ago we had a little chat, of course I said yes to it! Although it was a bit clouded yesterday , temperatures were real nice to sit outside. So we had our chat, and a loooong walk through my little garden, and it was a nice time. After she left, it was already a bit too late to start with the painting, so it will be for another day. Probably not today, cause there are errands that need to be done first. There was yet a nice thing yesterday at my bank account. The health insurance payment was effected again. Yoho, it came at a good time. Now we are only waiting for the taxoffice to pay the money back on Jan's name. I already recieved the one to me, but we would like to have it all, finally. If not on the account today I think I will make a phonecall, and ask why it takes so long. Oh boy, I am looking out of the window and see more rain and also wind to it, I hope that will pass away soon, cause I have to go out for a little shopping today. And I rather do that without getting soaked. And that is my whish for our royal couple, that will visit today our city and some other towns in our province. Our king and his queen made a whole tour through all the provinces ot The Netherlands. Their last visit is to ours. It would be nicer if the rain stopped by the time they will arrive. This tour gives a lot of people the opportunity to see the royal couple and even meet with them for a moment. I will see something about their visit later on, on tv, no I am not going to a spot where they will be today! 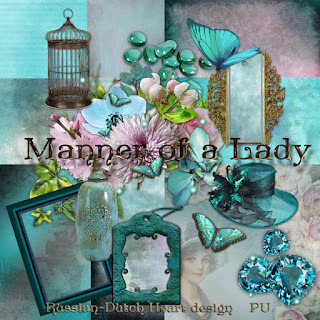 Kit for today isa bit vintage looking, named "Manner of a Lady". 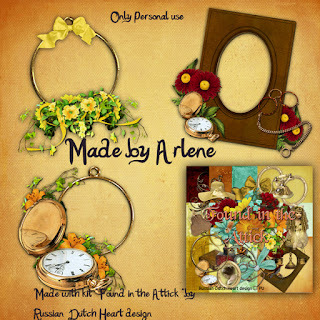 Not too many elements, but I think enough to make a nice layout, and look at the add-on from Arlene. 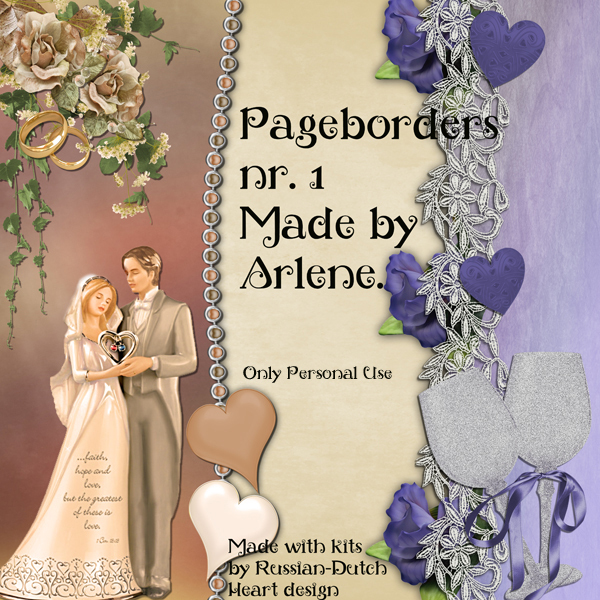 You have two clusters and a beautiful quickpage as well! I think I can spend now a bit of time working on a new kit, waiting for the moment it will be dry outside. Have a wonderful weekend, see you on Monday again! It's been a real warm day! Monday was a day of little things being done. Some ironing was done, some cleaning was done, I even did some sewing, all things I am happy about. I even messed out the sewing box LOL! It was a necessary thing, and now it is easy again to find something. Oh boy, yesterday we had a really warm day! At some time it was even a bit too wamr to sit outside and it was much better inside( our room stays rather cool in summer). Out bodies have to get used again to real warmer temperatures, only that is the problem here. although today could be also a warm day again, we have to count with some rain, or even thunder and such later today. And then according to the weather forcast, temps will drop again drastically, for something like 8 to 10 degress less. Then your bodyu gets no time to get used to warmer temps, is it? But I had a nice time in the garden watching the little birds come to the feeder. And in the evenings I can spot a frog family hopping around and there is a little taod family too. Oh whee, there is enough life in our garden. I even managed to get a photo of a little bird at the feeder, I haven;t such a good camera as my friend Edna( with extra lenses for making real clos-up shots, she makes terrific bird photos!) but there is one rather decent one to show. It isn;t unsual at the moment that there are 3 or 4 at the same time trying to get a little snack. I think it is a parent-pair with a couple of youngsters. Isn;t it sweet? And I have some pictures from the garden too, 1st one if of some lovely little flowers, we calle them "Ice flowers"they only open up when there is enough sun. This second one is of a cutling I made of the HUGE hydrangea I have, and it took some time, but now it is flowering, yeah! This hydrangea is special to me, cause I got it from a good friend of ours, who passed away about 10 years ago already, and the bush started as a little things, but now has a prominent place in the garden. Every time I see it, I think about her for a second. I have to do some errands today, like going to the drugstore, to pick up some medicine, and also want to give the room a quick vacuum cleaning. With the garden doors open you get a lot of dust and stuff inside, and also it's messing up a bit quicker, because of the street work that is done, lots of sand, well, you always walk in some of it, and that will last for a couple of more months. There isn;tmuch sun to see at the moment, although temperature is nice, a bit of light rain is coming down, it surely freshes up the air, but I hope we will have still a bit of sun. The garden is happy with it, you see plants growing like mad now LOL! I thought to offer you today another Nutshell kit, I think Edna will be happy with it, it is one of her favourite colors, orange Rofl! 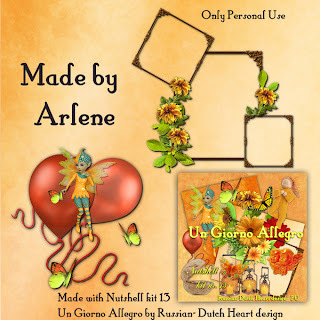 It is named "Un Giorno Allegro"( a happy day), and yes, Arlene also made two lovely clusters for you. This kit I used as bloglayout before this current one. Stay safe, and have a wonderful day! Well, we had quite a nice weekend. What did we do on Friday? I firts did a little of foodshopping and when I came home again, we first had something to drink and then we went to the market. It was rather nice weather, so a good time to do so. We were in need of some fresh fruit, and the best place to buy is the market. But.........I found a bargain there too! There was a stand with lots of trousers, so why not have a look? 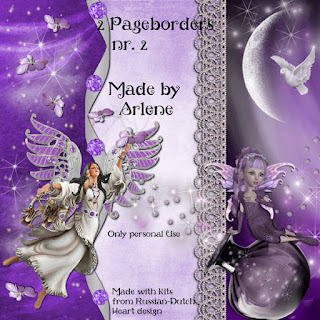 And I found two for Jan, that he liked too, and you know what? They were priced at only € 5,00 a piece! Unbelievable, isn;t it? You wouldn;t expect they were any good, but on the contrary, they were of good quality, really. Now Jan has enough good trousers for the whole year and longer. Such bargain finds make me happy! We also bought a bit of fruit, and oh, the plant stand was there again!!!! does it wonder you that we came home with a new plant? I don;t think so LOL! It's a rose bush that will stay rather low, can grow about 23,6 inches high, but it is more a ground cover rose, that can spread around for about 40 inches. It is full of buds, and soon they will open. I will show you some photos when they will bloom. The last couple of days there is some fierce wind, which makes it less agreable to be outside. But Saturday we took a little walk, to a school not too far away from us, where a friend of us is working and they had their annual "party". It's more playing time for the kids and some attractions for them, but it was a good reaon to see our friend, and we even met with a couple of old aquantances, which was nice. We didn;t stay very long, because there was still a lot of wind, so returned home. Yesterday is alreay was better, we were able to sit in the garden, and do nothing. I watched for some time some little birds that came to the birdfeeder, and I love to do that. I am glad there still are some birds around, because they don;t have as much room to make their nests as for some 10 or even 20 years ago. Lots of houses still have gardens, that isn;t the problem, but a lot of people just put tiles and terrasses in them and not much plants and trees anymore. Not good for the animal world in the cities. But in our neighbourhhood still is some greenery so it is good to see that some species came back and now I can watch them in my garden. When I was snailhunting yesterday night I saw that our little pond is used again. Yes, I saw a little frog in there, having a nap! Today the weather conditions look already to be better, still a bit windy, but that will change too. They siad on the weather channel that the next few days wind will diminish and temperatures will rise, so we will see how long that will last. Perhaps today is just the good day to do some ironing, and I should also shorten Jan;s new trousers. Then I also have to finish the garden archive ledgers, put all articles on place etc. So enough things to do, and therefore I will finish now, to start a little bit in time. 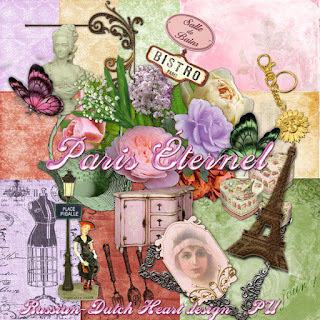 I have a kit for you in French style, hopefully you can use some of it. It's is named "Paris Éternel". Have a nice day, and try to have a smile somewhere today! Gosh, why do we have to cope with not working administrations? 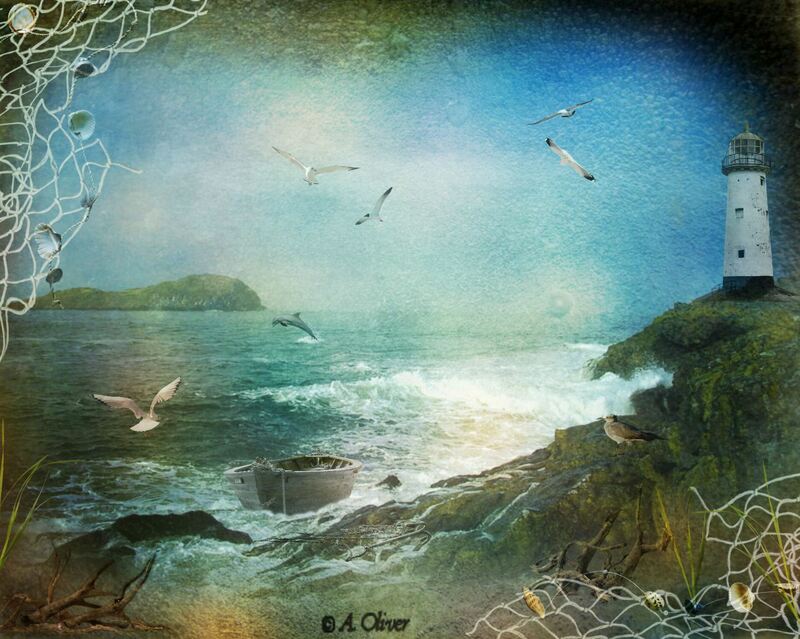 Just read my friend Edna's blogpost, and she mentioned the famous "Murphy's Law"! When something CAN go wrong, it DOES, and one thing after another, and well we know all about it. Do you rememeber a little about the health insurance troubles with Jan? 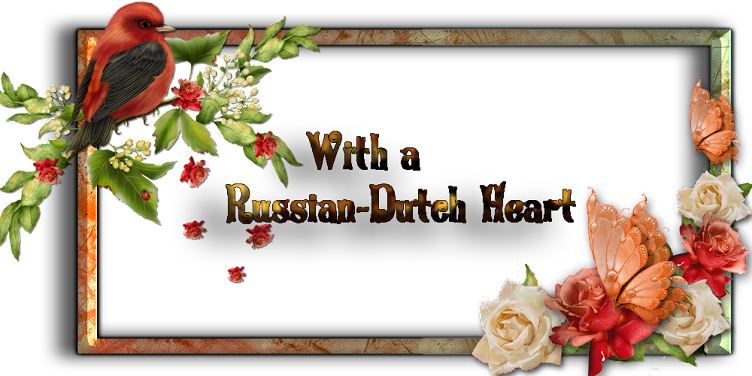 Last information was, that the insurance would pay a bit lopnger till the 25th of June at the least, then Jan will have an appointment with the health insurance doctor, to see about his health and possibility of going to work again. But then came yesterday. Another letter, in which the health insturance wrote that they wrongly payed us last week money, and that we should pay it back. How is that possible? While the last guy told us, he would extend the payment. Okay, Jan took the phone right away and called the department where they handle the payments. He explained the whole situation( glad we worte down all the named he talked to lately!). The lady at the phone at least understood the problem, that we couldn;t do without any money, but said that the last guy had in fact no right to decide what he did. Oh glory, how wonderful! The lady said we would be called back somewhere the next day before 14.00 p.m.
Oh surprise, we were called back within 30 minutes already! ANOTHER LADY. She understood the problem, Jan explained again what all the agreements were, and now the lady said, that the repayment we were ordered to, wouldn;t be effected, and the payment of the health insurance money would be continued at the least till he had the appointment at the 25th of June. She also advised him, not to work(if there was any) for the agency till then, to avoid any other problems, not to call with any of the other guys he had contact with, just to stay put ! Pfffffffffffffff, that was a relief and I must say the lady(we wrote down her name too, to be sure!) was very understanding and nice. But what a mess it is between the departments of the health insurance, they ALL can look into the file of Jan, but perhaps some of the guys didn;t write all down that was agreed or what?????? Anyway, it was solved rather quick, we can be at ease for the time being. Only thing was, that I just mailed yesterday morning to the agency, to ask if there was a possible shift for Jan in the weekend, and now I had to call them, to cancel his availability schedule again, explained the whole to the girl that is handling Jan;'s account, and more or less she understood all the thing. So now he is written down again as being "siock"till he gets the verdict on the 25th, and Jan will visit them after the appointment with the health insurance doctor. That's quite a story, isn'it? LOL. So did we do any "normal"things these days? Yes, we did. I went out on Wednesday for some food shopping, it was really nice weather I must say, came home, unpacked, turned on the washing machine, and started already with preparing the dinner, partly. This done, I went into the garden, and pruned a lot of the ivy and some of the bushes needed a trim too. That all done, I sat down at the computer, to continue on a kit, and then Jan came home. Yesterday the weather had changed a bit, there was a lot of wind, even some rain, although temperature wasn't bad, the wind made it feel a bit colder. But, apart from the phonecalls we had to make, LOL, I even got some things done again in the house, like changng the bedsheets. And I uodated my garden archive ledger files with some new articles I cut out of the pile of garden magazines. 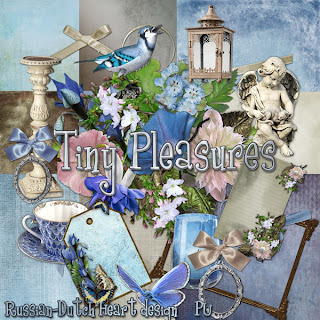 Still have to do hte one with all wonderful examples of little gardens people made, looking at the pictures and reading their stories really gives you new inspiration! 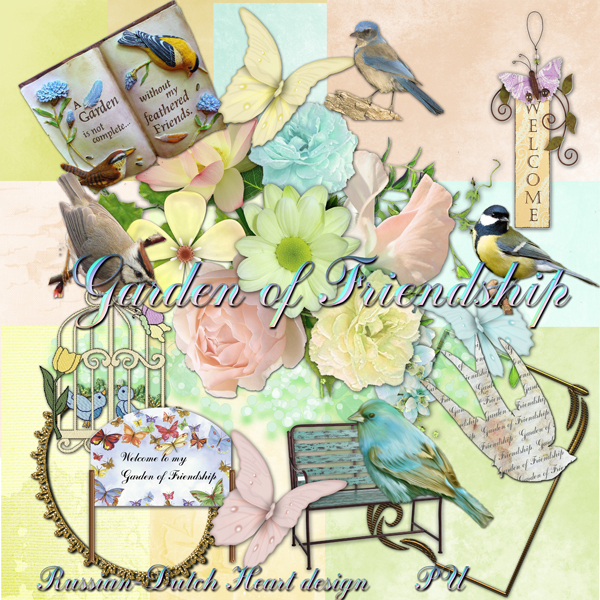 Now I will have to collect new garden magazines again, ROFL, but I will be a good girl and will not buy them too much(they aren;t the cheapest to buy, you know!). 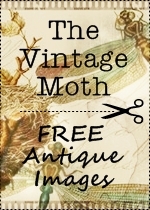 But may be I will find some for a lower price in a second hand book shop or perhaps at some fairs that will take place every now and then. And Jan polished all the cupboards in the room with an oil we have specially for that kind of wood. Wow, they are shining and looking great again! Today it is windy again, but sun is shining, so it is possible Jan and I will go to the market, if weather conditions stay as they are at the moment. And now it is freebie time, yeah! 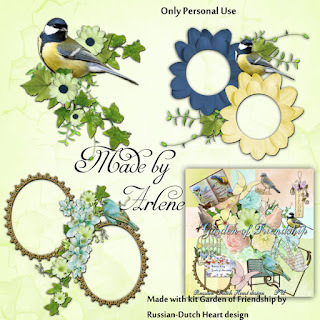 Mother's day is long gone, but perhaps you still have some photos on your harddisk that you want to make a layout with? If not, this kit also can serve for many other layouts, don;t worry! 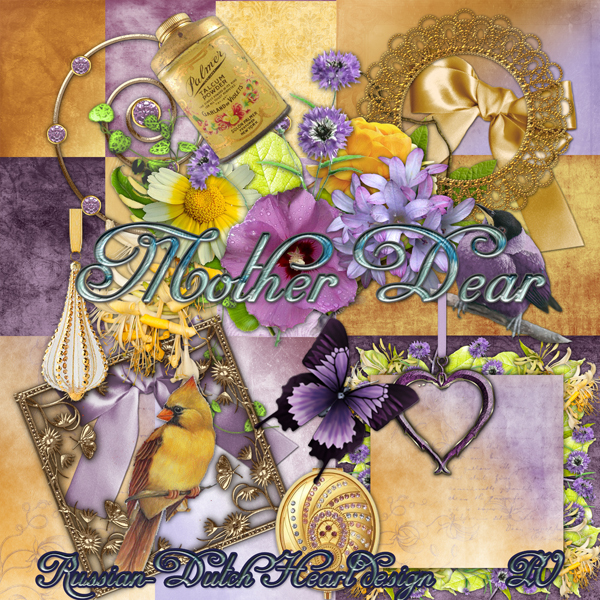 The name of the kit is "Mother Dear". In soft yellow and lilac, how great is that? I even made you a stacked paper in it. 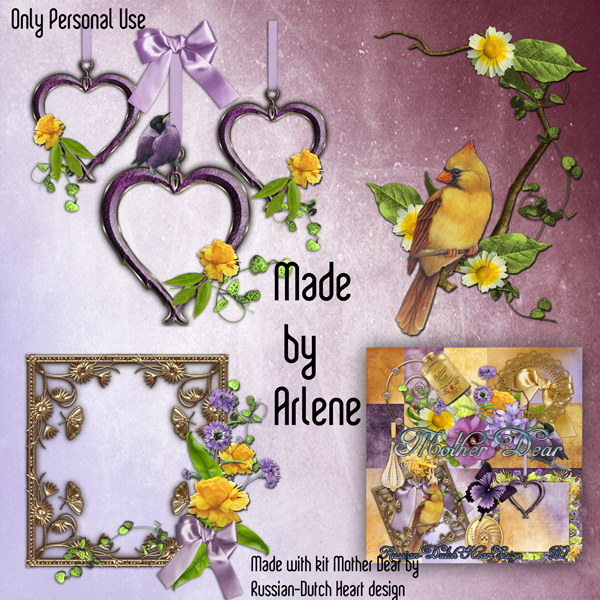 And then you also have some sweet clusters from Arlene, enough stuff to make some great layouts. Hopefully we will not recieve any more disturbing letters this weekend, we had enough of them for now!! You have a wonderful weekend, and I'll be back on Monday. Isn;t it a wonderful thing to say, that some things you had on the to-do list are done? well, I think it feels good. Monday I had some plans, but you'll never know what comes of them, lately I better do not plan too much, it always turns out to be different, grin! 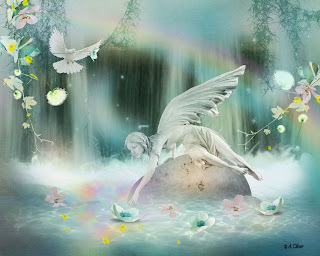 This time however, a miracle took place, I made some plans and I achived them. 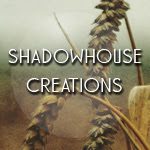 After I finshed my blogpost, I stayed a while longer at the computer, but then drastically shut the thing down and I started doing something. I started with some dusting, a bit more thorough than usual, and then I arrived at a cupboard, where I have standing a lot of crystal. The glass plate, on it really needed a clean-up, so I took off all the crystal stuff, and yes, you may have guessed, that lot looked not so good. I took it all to the kitchen and gave it a good clean. And oh my, it is sparkling again! I even found a left over from Christmas, well, it ca stay there till it's time for him LOL! Then I had a tour with the vacuum cleaner, did that a bit more thorough too, so when that was done, I decided it was good enough work for the day. Yesterday it was real nice weather, and I went into town centre, to take a look there, I don;t come there too often, so every now and then I like to spend a bit of time in several great shops there, where you can find all kind of things for a nice price. Did I buy something? Yes, a couple of things, which were in discount. You will laugh if you read what I bought. Some seed packets, 3 for € 1,00, also a little kit to grow radish, just for the fun of it. Also found a sweet little bird feeder, sorry, forgot to take a picture of it). Some other stuff I needed, but I was really, really very moderate. Spotted also some things that we might need later, and now I know where i can find it. Oh, even bough me another garden plant, hopefully that one will do well, and if it comes to full bloom I will try not to forget to take a picture. After I came home, Jan also arrived after a little while from a bike ride, and then we planted the new seeds, re-potted some of the seedlings, and suddenly it was dinnertime already. I've made a couple of pictures of the garden again, first one is my clematis that has opened its first blooms. Every time I see a clematis flowering I get so greedy. I do want to have more of them. If you search well, you can have clematis flowering about 9 months of the year! The I have a picture of an Aquilegia, I love those plants! I think there are about 60 different species of them, and I have only two or three of them. 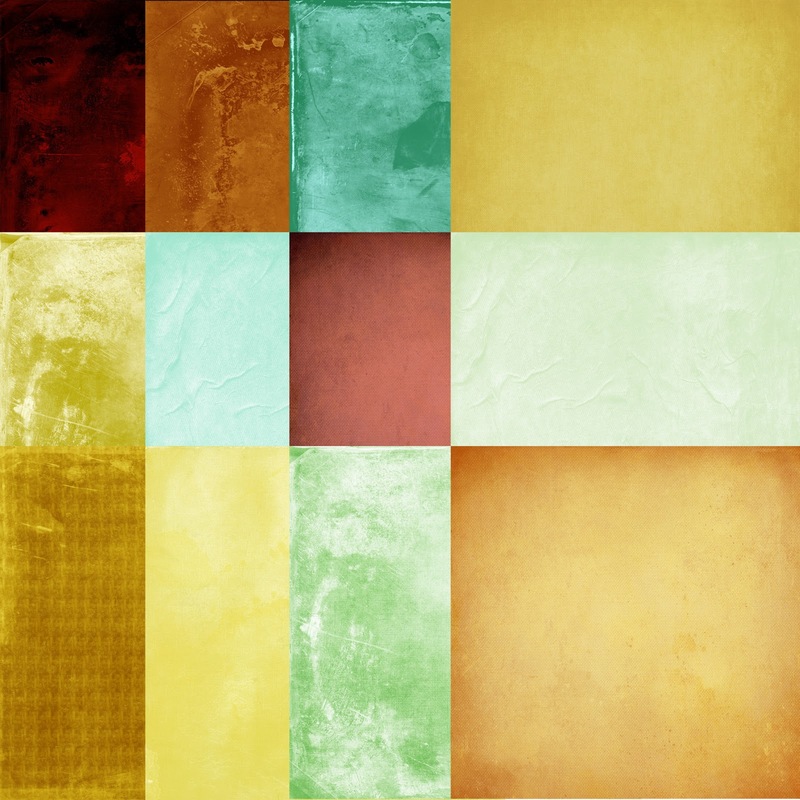 They also come in much different colors, from lilac, to pink, to white and yellow. Yeah, I definately have to have more of them too. And the last one is of a part of my rose, now doingan amzing effort to compensate us for the bad weather we had. Soo I think I will have pictures of another rose in my garden, which is a bush, and has white flowers. At the moment it is producing a lot of buds. Now today will be another day of attacking some things onmy to-do list. First have to do some food shopping, then another laundry is waiting and if I have the energy I may attack the bedsheets too hahaha. 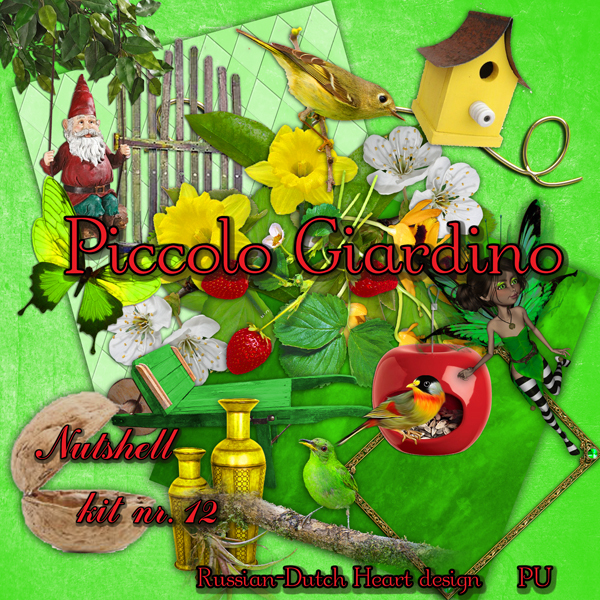 Now that I talked so much about the garden I think I will offer today another nutshell kit, in a bold green color palette, named Piccolo Giardino (little garden) , and there are some adorable clusters from Arlene to it too.! Now you take care, have some work done, have some fun too, in short: have a wonderful day! I moved one of the frogs LOL! Friday I announced I would do a bit of housekeeping, and oh wonder, I did so! I let the washing machine do it's job with a full load, and in the mean time I did the ironing. That was necessary, cause the pile became a bit too high, now I am glad it's done. That was about it I did, yes, I know, I could have done a bit more, but I promise I will do it today! Yesterday afternoon we went to Heidi's 40th birthday party. I am not such a birthday party person, but of course I couldn;t let her down. She looked great and all happy, and as usual we didn;t get much time to talk to eachother. And of course that is understandable, she has to devide her attention to everybody. So we just had a few secs, and when we left Heidi and I laughed again and said to eachother the ever-returning words when we see eachother at a party: "Oh my, what a great talk we had again, but we know it, on parties it almost never happens, grin grin"
But we will see eachother this week and then we can chat about all we want. Now every day we see something new that is coming to bloom in the garden. It's about time now, all is a bit late because of the too cold weather till now. Let's hope that we will be compensated for that the next couple of months. Almost every night or every other night I am sneaking throught the garden with my little flash light, to go for snail hunting LOL! I know they are necessary in nature, but let them do their job somewhere else and not too much in my garden. I know almost all the spots (read plants) they like to visit and it feels good to be the rescue ranger of some of the plants, hahaha! And doing the hunting, almost every time I encounter my little friends, the frogs. So nice to see them, it also means that the environment in my garden isn;t too bad. Yesterday evening I spotted one rather little one at the terras near the kitchen door. I wondered what he/she was doing there? So I picke it up(with my hand in a little plastic bag, so not too harm the frog and I don;t like the feeling of the vreature in mty hand) and placed it near the little pond. There it could find a nice hiding place under the rocks or under some ground covering plants. I hope Jan will get a couple of shifts this week, so he can have a try-out on how his condition is and if his back will hold on when he has to do the biking from house to house and such. Later today I will fill in his available-schedule for this week at his acocount of the agency. Yeah, I am the one doing it for him, he isn;t very used to computering, so I act as his secretary" ROFL. Well, I will look now for your freebie, in my stock. Yes, I know which one it will be today. 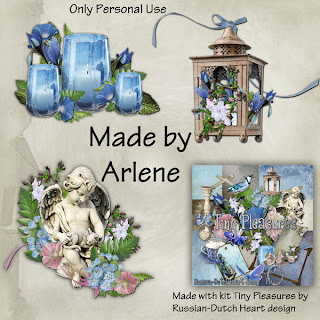 This one is named "Tiny Pleasures", and and add-on from clusters by Arlene. We are getting a bit nuts about the not working well together of several departments of the health insurance . Before to get into any trouble I phoned the health insurance announce that Jan recoved(more or less), starting the 5th of June. The lady there checked Jan's file and said he already was announced healthy again for work from the 27th of May. I told her it couldn;t be so, explained Jan had a phonecall with the guy of the health insurance of the medical department and had a total different agreement. Well, I gave the phone to Jan, he explained the whole sitation and the lady seemed to understand a bit the problem and said Jan would be called back by the fellow who send the letter where they stated he was better again at the 27th. Oh wonder, the guy called back yesterday. Jan explained again, that he had to go to the agency already, because money for living has to be earned, and now it seems that probably the other guy of the health insurance department "forgot"to send the papers through ( that one is from the medical department the last one is from the insurance money department). But the medical one was on holiday now(yeah, we are always so lucky!). To cut it a bit short Jan has now an agreement with the last guy that Jan still will receive insurance money for a couple of weeks, but if the job agency has some shifts for him, he can do them, as a sort of try-out, but has to tell that to the insurance. 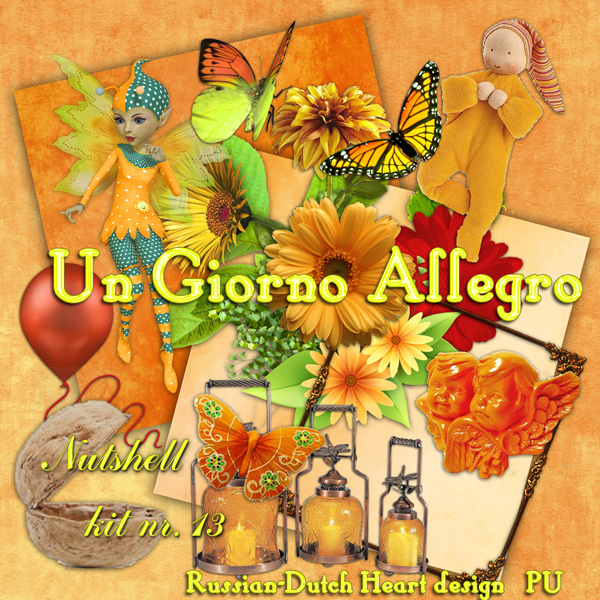 Then around the 17th of June guy nr.1 is back from holiday, Jan has to phone him, And soon Jan will receive a letter from probably guy nr.2 wioth an appointment for a health check up done buy possibly the real doctor Jan went to a couple of months ago. Then they will see, what they will do. Or Jan will be declared helathy for a 100% or may just partly for a while, which means he will get payed partly by the health insurance and partly by the agency if they have work. Complicated, isn;t it? But worst of this all is, that it takes us time, phoning left and right, just because their administration isn;t okay!!! Aside of this stuff, we had some nice days, with great weather,and we took some profit of it. And I am walking a lot lighter again, cause yesterday I got a very much needed hair cut! It feels so good and I wanted to have one before Sunday. Why? On Sunday my friend Heidi is celebrating her 40 th birthday! And they give a big party, because it is a little wonder she is still around, having her to cope with the lung disease. It sn;t so obvious that people who suffer from it get very old, and some years ago we were in doubt if she would reach her 40th birthday. I already called her yesterday( the actual day) to wish her a happy birthday, and we just talked for a few minutes, but agreed to visit eachother somewhere next week and have a chat in quiet and peace. And there is someone else who had her birthday yesterday! 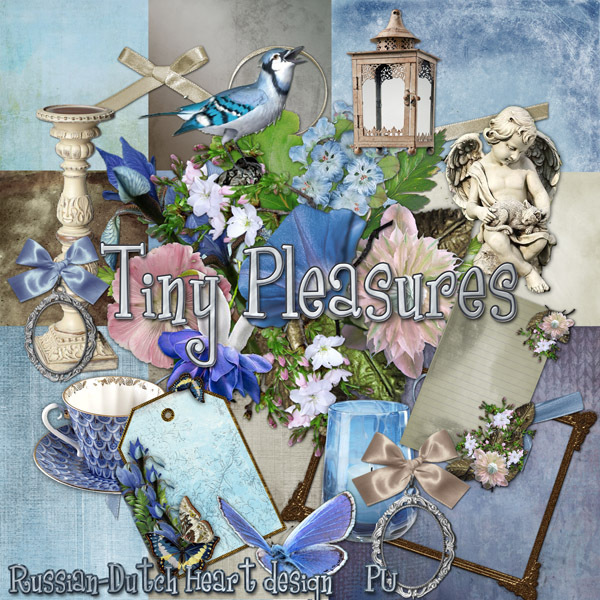 It is Linda from Random thoughts of Linda, this nice lady who offers such beautiful quickpages! Might be nice if you drop a little happy birthday to her! I have no idea what I will do today, LOL. Enough things are waiting to be done, like a laundry, some ironing and all that stuff in the house, but today it also will be a nice sunny day, while the next days temperatures will go down a bit again, and may be some rainshowers will visit us. So may be I just do some of the house thingy, and forget about some others and take advantage of the weather while we still can.Yeah, it sounds very lazy, it probably is, but why not? LOL. I cut some potatoes in thin slices, layed them in a frying pan, bit of salt and pepper on it, on that the two dorado's, again a bit of pepper and salt, added a bit of olive oil, a teacup of chicken-broth, some dices of butter, some garlic and shallots, covered the pan with a lid(not completely) and put it on a moderate fire for about half an hour. Just added some salad to it and it tasted yummie.! Yesterday we had a yummie meal too, because I found 4 big mushrooms(portobello) at the market too, I stuffed them with mozarella and little ham dices, together with a bit of pressed garlic, pepper and salt. In the oven with a bit of oil and butter, for about half an hour(depens a bit on the size of the mushrooms), I made baked potatoes to it and again a salad( green with a bit of tomatoe and dices of raw paprika) and that was delicious too! So today we will have the "free kitchen"again, meaning Jan and I will make our own thing for dinner, probably will be something very easy, and quick! 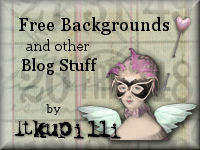 Well, I took enough of your time, let's go on to the freebie for today. 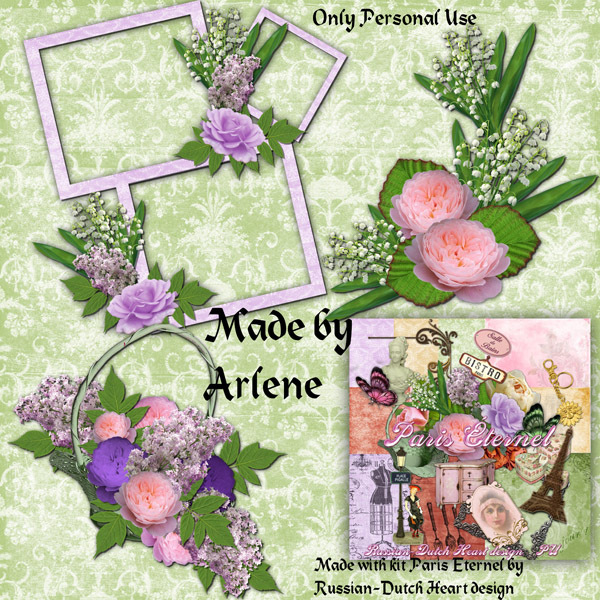 It is the kit "Garden of Friendship, in very soft pastels, and sweet clusters from Arlene. Oh it looks to be a nice week, speaking of the weather conditions. Every day it will get a bit warmer, so may be finally we will have some late spring and a good summer? But the weather is really behaving od here in Europe! For now they have rivers flooding in the Czech Republic, Austria and parts of Germany! The last couple of days there was so much rain, sometimes 400 mm a day. The water level of the Rhine, Danube and now the Elbe is rising drastically, today it was about 13 mtrs (around 42 feet!) and this is reallyy exceptional. Worse is that a lot of that water is coming our way. Now we have possibilities to get rid of a lot, they open floodplains, we have special dykes, but in some areas they moved away the cattle already, and possibly also some people have to leave their home for a while. All that strange weather has to to with the long staying low pressure areas above Europe, I heard in a program yesterday, and that is due to the minor powerful jetstream on the Atlantics. And that again should be influenced by the quicker warming up of the North Pole. Then there isn;t as much difference in temperature between the air ocoming from the North Pole and coming from the equator, that together make the jetstram move a lot slower, and that causing the low and high pressure areas linger longer at one place. Strange weather? yes, because at the moment in Findland and even in the north of it they have temperatures of about 30 C (86 F), and also in Russia, and that isn;t normal for those parts of Europe. Okay, we have to live with it LOL, and I have a link for you where you can see something about the flooding in Germany and such. I promised you I would have a picture of my climbing rose, Zépherine Drouhin (love that rose, cause it has beautiful flowers, bloosoms very long and has no thorns), and so I have.Made it just this morning. Soon it will have lots more flowers, and I hope I can cut one or two from time to time to put in a little vase. I don;t cut often flowers from the garden, I like them better in their natural environment, but sometimes it is nice to have a little bouquet in the house too! My cold is getting better already, although I have still a full nose, just hope with the sunshine we will have it goes away soon. Today I want to go to the market again, I can take advantage of that trip to deposite a couple of bills at the bank, and I'ss see what I will come back home with from the market. Probably I will by me some fish for this evening's dinner. And I have to buy me a cartridge for my printer, and then I hope I can get it printing again LOL. My printer doesn;t print when one of the cartridges is empty, cannot even print in black then. Very annoying and then I also have to perform a little trick so that the printer will "recognize"the compatible cartridge. Compatibles save money, but some printers are very stubborn in not wanting them hahaha. We'll see if I suucceed, being not a handy person in those things. Our froggs are still in the area, you know?. Specially in the evening it happens we see one or two of them, and yesterday Jan spotted a tiny little one, heading a bit direction of the little pond. So may be they have found it and will use it soon from time to time, now that it is getting a bit warmer. Okay, that's it for the moment. Let me think about your freebie. 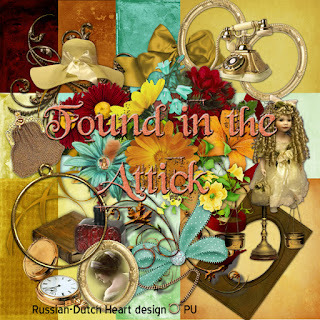 I have a lt of possibilities, so I will check now what I have "on the shelf". Just a moment and I will be back with one! 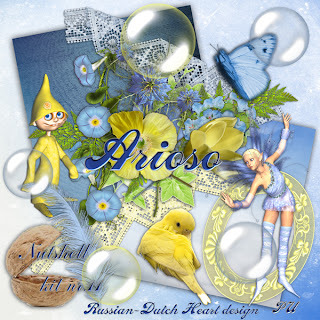 Yes, you will have another Nutshell kit topday, named Arioso ( airy). You can see it "at work"in my bloglayout, nice hey? After I posted this one I will do a bit more blog hopping, may be even a moment playing in PSE, and then go out. I hope you all had a real nice weekend? Mine wasn't too bad either, although I catched a little cold now. Not too bad, I think it will pass soon enough, but it is no wonder it happened with all that fast changing weather here! I went to the market on Saturday, but just that day we had a little fall back in weather conditions. It stayed dry, but it was rather unpleasant, with a wnd that felt cold. I guess I catched the cold then. Oh I was such a strong girl at the market LOL! On Fridays and Saturdays there is always a big stand with all kind of plants and bulbs, and there were such beauties they had! Specially a couple of roses, some ramblers but also bushes. But.... I didn;t buy any. Perhaps it was a good thing the weather wasn;t as good, that also plays a role if you buy plants for the garden or not, yes, that really is true! Yesterday it was better, we even did sit some time in the garden, and the sun felt so good. Now this week their might be some hope concerning the weather. If we can believe the forcast temperature will rise during this week till at the end to around 70 F. And with sunshine. Cannot wait to live it! Jan went to the agency to announce he wil be available for work again from tomorrow. It seems there is work enough so hopefully he will have a niceschedule. Now just hoping he can hold on and that he won;t have a fall back( specially with his back). Just had another nice mail this weekend, I also receive back some money from the tax office. Well, that is coming at a very good time. Oh, we have a new hose for the garden( what a striking news LOL). But it was necessary, because the old one still worked not too bad, only the fittings (some of them) were at the end and the diameter of the old hose isn;t standard, so hard to find new fittings. But we also wanted a bit longer hose, and finally Jan found one, with fittings, of 20 meters long, for a very nice price. I tried it out yesterday and oh, it's marvellous I have enough length now, to easy reach the end of the garden. 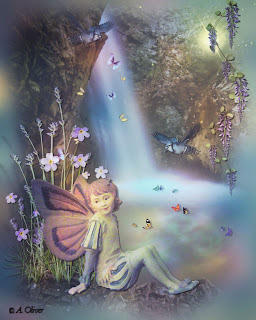 This afternoon I will have to go to hospital, for the annual check up with my neurologist, for the epilepsie. No big deal, but it has to be done. Hopefully I will not have to wait too long and will all her appointments go right on time! My climbing rose is really going to bloom now, I will try to get a photo on Wednesday's post. And if the weather really will be as nice as they predict, I suppose that in a few days their will be lots of buds opened. That should be a fantastic view! Today I have a kit for you in warm colors, I've made it in a two part download, for easy handling. 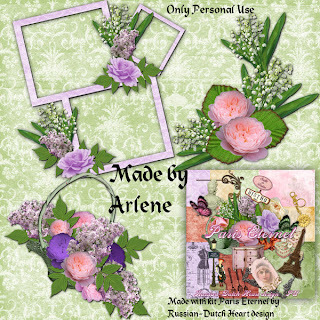 Also made a preview just from the papers, so you get a better idea of the kit, Arlene made again some lovely clusters. This weekend she did sent me a bunch of new ones, and she always manages to amaze me! Oh, we have some beauties for you in store!! Name of the kit is "Found in the Attick". Have a lovely day, stay out of trouble LOL!